Between 2500 and 3000 people found their way to the Apparatjik concert at the new Astrup Fearnley museum in Oslo last night. 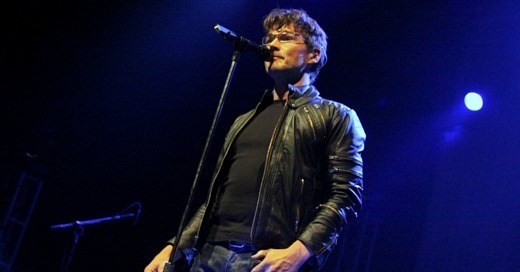 Morten and his band played at the Gran Rex theatre in Buenos Aires yesterday, for an enthusiastic crowd. 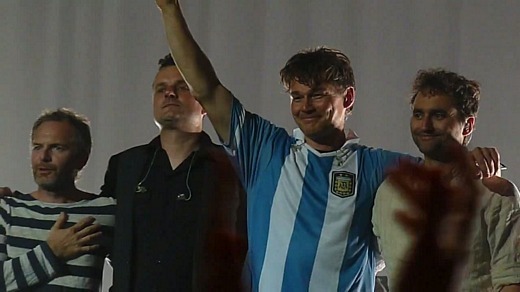 At the end of the show, he put on an Argentinian football shirt, to much applause from the audience. “Somebody gave me this. It certainly looks better on a footballer, but there you are”, Morten said. There are also some rehearsal videos from earlier on, posted by Alyssa Nilsen. The main event – tonight’s free concert at Astrup Fearnley – starts at 9:00 PM and features a new cube. “The new cube is made especially for this show. 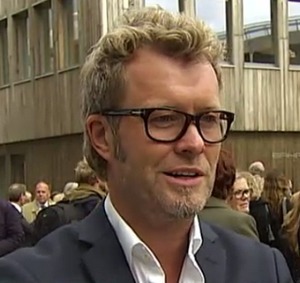 We were originally planning on positioning it above the water, but they’re expecting a spring tide, and combined with 220 volts through our instruments that wasn’t such a good idea”, Magne says in an interview with Dagsavisen today. Guy Berryman once again seems to be busy with Coldplay, so he’s not taking part. 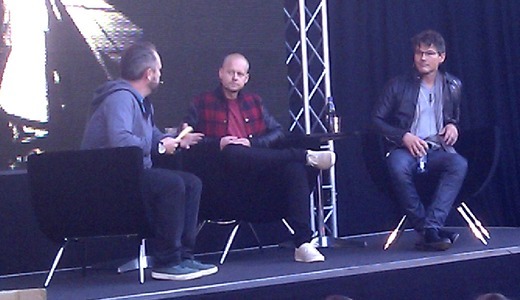 Magne, along with Jonas Bjerre and Martin Terefe, attended the official opening of the new Astrup Fearnley museum in Oslo today. There’s a photo gallery from the event at vg.no. Afterwards, they were guests on the radio programme Kulturnytt on NRK P2, to talk about their first impressions of the museum and the upcoming Apparatjik performance there on Saturday. “I don’t think it fits at all, because we’ve made it a specialty to fall between two stools. Most people in the art world think we’re way too pop-oriented. And those expecting to hear pop music think we’re too arty. So we have ended up somewhere in between, where we don’t manage to connect with anyone. 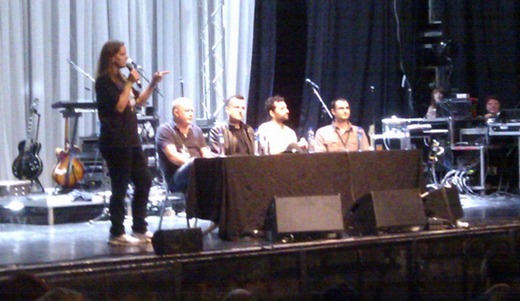 But we do create music that we like, and the songs are quite structured. We’re not attempting to create very inaccessible stuff. We just don’t want to do things the way we’ve used to in our main projects. We were shocked when we entered the stage at Roskilde this summer and looked out on an audience of 40.000 – 50.000 people, who stood with their jaws dropped for the first 15 minutes and then ended up jumping up and down to music they had never heard before. It was very exciting. I had never entered the stage before, without having at least a few hits to get the audience going. So it was incredibly fun. I think people with a certain sense of humour will feel this is something they should witness. 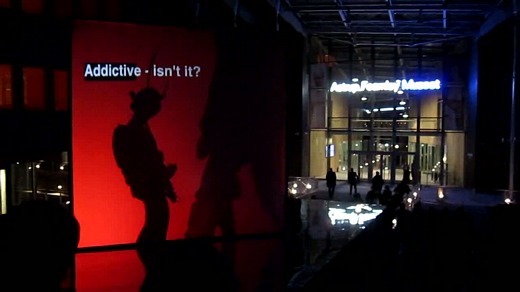 And it takes place on Saturday at 9:00 PM”, Magne said. “It’s important to stress that this is not a concert for the elite, but a free concert for the people of Oslo – and anyone who comes from out of town. We’re going to create a lot of noise, so this is not a part of those posh opening ceremonies”, he added. The whole interview is available as an MP3 file at nrk.no. Tonight, Apparatjik and Lowell did a “secret” warm-up show at DogA – the Norwegian Centre for Design and Architecture in Oslo. A few pictures were posted on Instagram by Monika and Tini from The Voice. Be also sure to check out a couple of new videos from the Roskilde concert on Vimeo, here and here. Morten played the last of his Brazilian solo concerts in front of 3500 people at the Credicard Hall in Sao Paulo yesterday. No changes in the setlist. While in Brazil, Morten also found time to answer a few questions sent in by Brazilian fans, which can be seen in this YouTube video. The tour ends with concerts in Buenos Aires tomorrow and Santiago on Sunday. 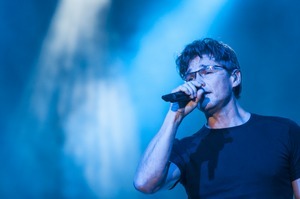 Morten continued his South American tour at the Chevrolet Hall in Belo Horizonte on Sunday night. The setlist was reportedly the same 18 songs as in Rio the day before. The tour continues in Sao Paulo tomorrow. 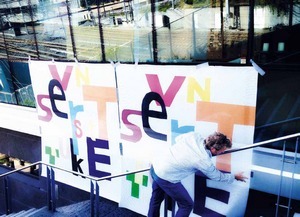 Magne is currently preparing a new solo exhibition, to be held at Galleri Trafo in Asker from 27. October – 18. November. “- This is a temporary artwork that will put its mark on the whole area during a limited period of time – in the way graffiti and street art can do, albeit in a more legal and controlled form”, Magne says. The whole interview is available as a PDF file at livein.no. 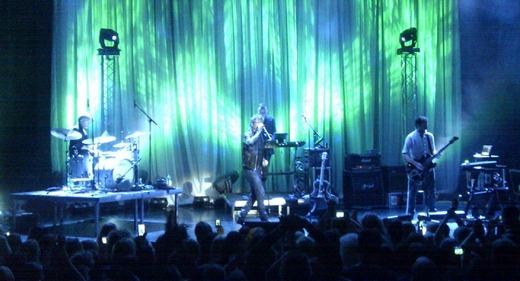 Morten opened his mini-tour of South America at the Citibank Hall in Rio de Janeiro, Brazil last night. 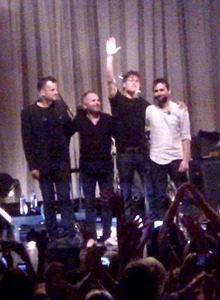 Compared to the Oslo concerts last weekend, “Send Me An Angel” was dropped and “Forever Not Yours” was back in the set. YouTube videos from Rio have been posted here, here and here. Pictures from the concert can be found at QUEM, Terra, Flickr, UOL and Jornal do Brasil. There is also a video interview on YouTube. 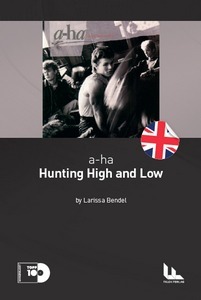 “But it’s easier and less lonely to tour on my own and with my own band than it was with a-ha. I have more contact with my band now than when I toured with Magne and Paul. I also feel more free. I can speak out on issues that I care about. 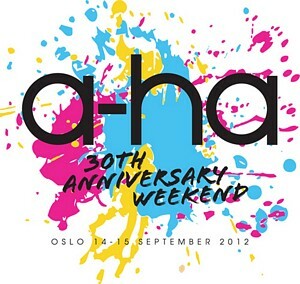 I couldn’t do that when I was part of a-ha”, Morten claims in the interview. During Saturday’s Q & A session, a fan wanted to know what Paul is up to these days. Another fan followed up on this, asking if this new material is in connection with Weathervane or Savoy. “The plans are not that concrete, so I can’t really speak on behalf of Paul. But I don’t think it’s Weathervane. 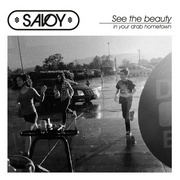 It may be Savoy. It may also be…there’s a female singer that has recorded a lot of Paul’s songs, that may be released. 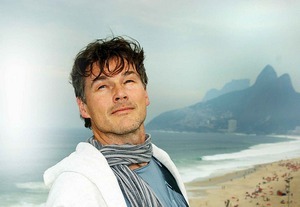 And maybe he’ll write a song for Morten, who knows…”, Wiik said. 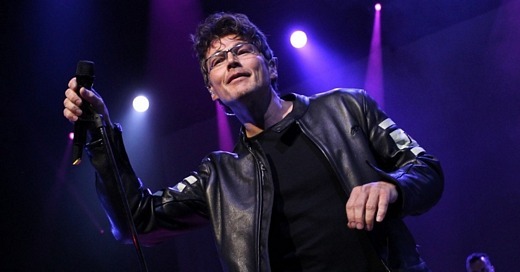 New album from Morten next year? “Basically, what we’re doing is to finish this tour now, with the South American dates. And when we’re back, basically sit down and talk about it. I know Morten wants to do an album in 2013. He has also started writing, among others with Peter Kvint – who worked on the Out Of My Hands album. So they’re gonna do a session in October, and then we’re going to Stockholm in November to do some more work with him. And then we’ll take it from there. It’s hard to say really, but possibly in September/October next year”, Wiik told the audience. 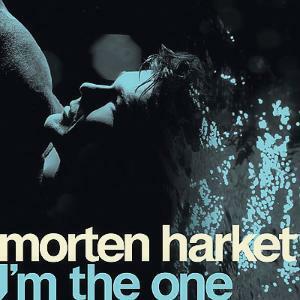 Posted in Morten Tags: morten harket, peter kvint Comments Off on New album from Morten next year? 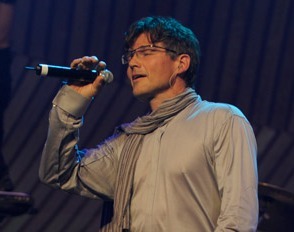 Morten’s next single from Out Of My Hands will be “I’m The One”, according to hr-online.de. The song was already made available as a radio promo in the UK earlier this summer, but will now get a proper single release in Germany. The release date is October 26th, but whether it will be available as a CD single or download only is not yet known. Like on the album and first single, the cover photo was taken by photographer Just Loomis. Morten attended the Clean Tech Media Awards in Berlin yesterday, where he was presented with the Green Music Award for his focus on environmental issues (see Aug. 25th story). 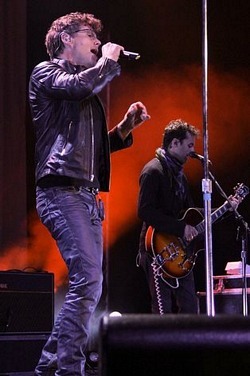 He also performed “Burn Money Burn” during the award show, which was held at the Tempodrom concert hall. Earlier in the day, he took part in a press conference in connection with the awards. 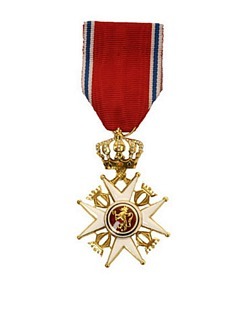 His Majesty King Harald of Norway has decided that the members of a-ha will be appointed Knights First Class of the Royal Order of St. Olav, after a proposition by Music Export Norway. The full press release is available in English at musicexportnorway.no. 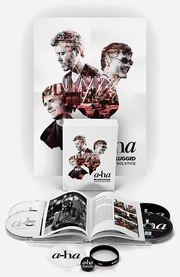 “Magne, Morten and Paul are very honoured to be awarded the Order of St. Olav”, a-ha manager Harald Wiik tells Dagbladet. The official ceremony will take place in Oslo on November 6th. 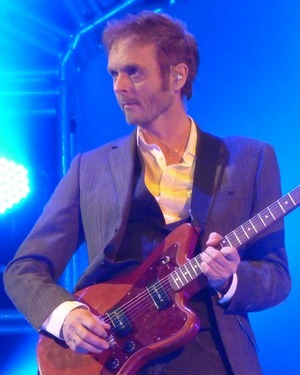 Other Norwegian musicians who have received the same honour in the past include Jahn Teigen, Åge Aleksandersen, Sissel Kyrkjebø, Jan Garbarek and Truls Mørk.